It’s surprising when you stop to consider it, but BMW’s sports car back catalogue is patchy at best – particularly alongside its pantheon of much-loved M cars. Of those roadsters, and original 328 aside, it was the first-generation Z4 that was perhaps the most convincing, something lost with the advent of the larger, softer, outgoing model. 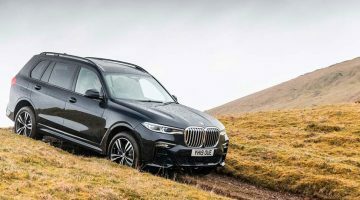 Now BMW is back for another go, and using phrases like ‘a raw driving experience about passion and emotion’ means expectations are naturally high. Can it deliver? 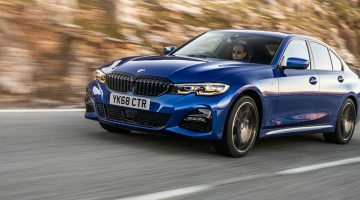 In time there will be sDrive 20i and 30i Z4s, both powered by a 2-litre turbo ‘four’ with 194bhp and 254bhp respectively, but for now it’s just the flagship M Performance model, the M40i, which uses a 3-litre single-turbo straight-six producing 335bhp and 369lb ft of torque. The only gearbox option currently is an eight-speed torque converter with paddles for manual control on the steering wheel. Despite weighing 1535kg the M40i’s performance stats look promising, with 0-100kph dispatched in 4.6sec and a top speed limited to 250kph. This is the car, remember, that was originally developed with Toyota before both parties headed off down their separate paths: BMW an open sports car, Toyota a coupe in the form of the new Supra. BMW’s new roadster is longer, wider and taller than the previous Z4, but while its tracks front and rear are also wider its wheelbase is actually shorter – something that’s obvious if you study the proportions in the photos. The firm has chosen to return to a simpler fabric roof, saving weight and lowering the centre of gravity, and has developed a new front suspension set-up to go with the five-link rear. This M Performance model has variable damping, variable ratio power steering, an M Sport electronically controlled rear differential and M Performance brakes. Most of all though, there’s talk of extreme body stiffness and of rigidity of suspension mounting points, all of which should do no end of good for the Z4’s handling qualities. The Z4’s dimensions mean it has a wide, squat appearance as you approach it, something magnified when you open the door and clamber in. It’s a broad cabin, nicely finished, but the wide centre stack and digital driver display doesn’t exactly shout ‘sports car’, and the extremities of the car feel far away and out of sight. At least the driving position is good, with plenty of adjustment. The electric operation of the roof is, predictably, faultless. So far, so good then. However, the initial perception of driving the Z4, and indeed of much of the time spent with it, is one of disappointment. That’s not to say it’s a bad car, far from it, but it is very much an undemanding one, and there are plenty of occasions when you’re simply drifting along in the Comfort setting, the engine all but inaudible, the steering lifeless and the auto slurring gears itself, when you wonder if you’re actually in a sports car at all. It rides well, and would be an easy-going everyday car, but this is far from the ‘emotive’ sports car that BMW promised. What is immediately apparent is that this is a supremely stiff open structure: there’s simply no shake from the body, even over poor surfaces. Not so much as a shimmy, even. Nevertheless, the Z4 does have another side. Yes, you have to select a different mode, either Sport or Sport+, and taking manual control of the ’box helps, too, although it can’t compete with a good twin clutch or manual in this application. While the ‘six’ gets louder it never sounds particularly enticing, but there’s no denying its broad and muscular powerband. The variable steering unfortunately has a really artificial feel, but the upside is that it induces an agility to the car via short, sharp, steering inputs that’s magnified by the shorter wheelbase. Driven quickly the Z4 feels quite edgy, largely in a good way, and when the tail breaks free it does so quickly, although the differential quickly hooks it back up again. These sensations are amplified on a track, where it’s easy to see how the M40i lapped the Ring quicker than an M2, and yet there’s still something missing – a connectivity, a sense of fun and involvement. The Z4 always feels like a wide, quite heavy sort of sports car, lacking the cohesiveness and poise of a 718 Boxster. This sector of the sports car market is looking pretty thin at the moment, with the Porsche 718 Boxster ruling the niche. 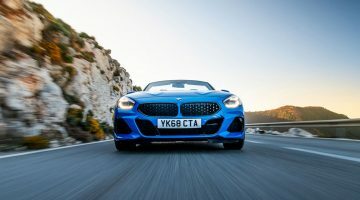 Given the Porsche’s hugely underwhelming four-cylinder engine, this was the perfect time to strike for BMW, but the Z4 has the feel of a car that doesn’t know whether it should be fighting the 718 or appeasing its traditional boulevardier clientele. Previous ArticleJaguar XF R-Sport 300PS review – a better sports saloon than a BMW 530i?